Whether you have a brand new house or are looking to re-landscape and update your home, installing California sod is a quick and easy way to create a beautiful lawn and almost instantly increase the value of your home. West Coast Turf makes it easy to find the right sod for your lawn with a large choice of sod varieties, installation and watering guides, and expert customer service. At West Coast Turf, our mature healthy turfgrass sod is harvested at night for daily delivery throughout California to ensure the freshest product. 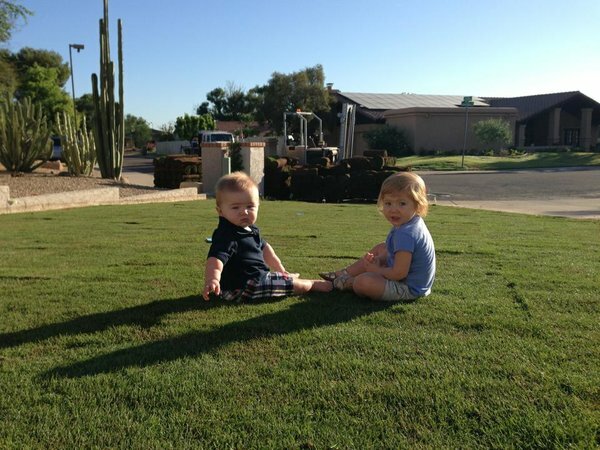 It’s important to install your sod as soon as possible after delivery for the best results. If you cannot plant on the same day as delivery, keep the sod in a shady area and cover with damp burlap sacking or sprinkle to keep moist. Sod is relatively easy to install and preparing the soil is a very important step. Be sure to remove large rocks and fertilize if necessary. You make choose to slope your lawn a bit to help with drainage and also be sure that your irrigation is ready before delivery. We recommend our California Sod Installation Guide, which provides detailed information including how to roll out your sod. It’s crucial to water your sod within 30 minutes of installation to help it bind with the soil below. Newly planted sod has different watering requirements than established sod and watering schedules will also vary depending on the season and your climate. Use our Watering Guidelines for Healthy Grass to help you determine the best schedule for your new lawn. Surprisingly, you won’t need to water your lawn every day. It’s important to follow the watering tips to ensure a deep root structure to establish a hearty and healthy lawn.